With the historic snow season behind us, it is time to look ahead towards the upcoming summer; will it bring unseasonably cool temperatures and plentiful rainfall, much like last summer? Will we scorch with day after day of 90 degree heat? 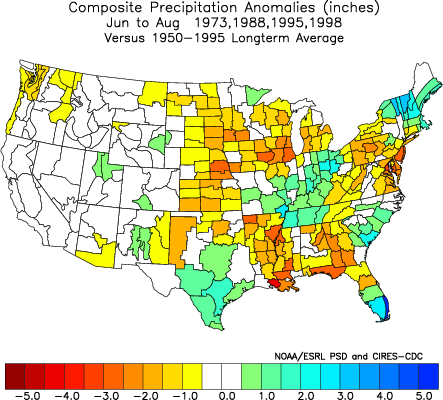 Or will it be a run of the mill, near normal summer, temp and precip wise? I will attempt to answer those questions in this discussion. There are a number of indicators which need to be examined in order to piece together the puzzle of the next three to four months. 1) ENSO – the strong El Nino of 2009-10 has been weakening rapidly over recent weeks, with region 3.4 values plummeting from strong, to moderate, and now heading into weak territory. This decline to near-neutral will continue through the remainder of May and into June, in fact, there is strong evidence that a La Nina event will ensue by the mid to latter part of the summer. Note the following sea surface temperature anomalies from February 7th, 2010, and the most recent SSTA profile from early May. The intense positive anomalies in the central tropical Pacific have been eroded significantly in conjunction with a strengthening negative PDO (colder SST’s in the northern and eastern Pacific). The Multivariate ENSO Index (MEI) saw its 4th quickest drop on record, from +1.383 to +0.875 over the past two months. This is part and parcel of the reversal in the PDO decadal phase, which switched from warm to cold back in the late 1990s; however, now we’re seeing a stronger and likely more persistent dive into negative territory. What this all means – the strong El Niño of the past 6 months was a temporary delay in the inevitable, which is a transition to more cold ENSO events (La Nina’s) over the coming decades as we see the negative PDO gain control of the playing field. El Nino’s can and will occur in this regime, but they shouldn’t be as frequent or intense as they are during the positive/warm PDO decadal phase. On a related note, this will also mean rapidly falling global temperatures over the next year. 2) Global patterns – the reversal we’re seeing with the Southern Oscillation Index (SOI – the atmospheric air pressure difference between Tahiti and Darwin) is remarkable, and on its own would suggest that a La Nina event of at least moderate intensity is oncoming over the next 4-8 months. While this is possible, I’m not sure I’m ready to go that far just yet, although weak La Nina ENSO conditions by the second half of summer is a virtual lock in my mind. Let’s examine moderate and strong El Nino events and their SOI reversals by the following spring/summer. For reference – negative SOI values generally indicate the presence or approach of a warm/El Nino, while positive SOI values usually suggest a La Nina is imminent. Note the SOI was negative through June, briefly switched positive in July and August prior to turning slightly negative again in September. ENSO region 3.4 numbers for that same time period (January to September). For reference – weak: +0.5 to +0.9, moderate: +1.0 to +1.4, strong: +1.5 or greater (RED=El NINO, BLUE=LA NINA, BLACK=NEUTRAL). Weak Nino conditions persisted through June. In other words, the slow reversal in SOI values mirrored the slow turnaround in Nino 3.4 readings. There is a distinct connection between these two teleconnections, often with a 1-3 month lag time as history shows us. A quicker demise of the El Nino event than 1958, which made a significant difference in US temperatures that summer; however, SOI values were still predominately negative. Thus we did not see any weak La Nina develop. The transition from strongly negative SOI to strongly positive by May/June caused in part the development and intensification of a La Nina (already moderate by late summer). Again, positive SOI values and La Nina conditions ensued at roughly the same time. Notice the SOI did not reverse as strongly positive this summer (remained near neutral) and thus ENSO also remained near neutral for the summer. Note that transition – a reversal from -2.3 to 2.0 in a one-month period! More impressive than even 1998. Our warm March/April was largely due a continued moderate El Nino and collapse of the record negative NAO/AO block of February. But now we’re already in a La Nina global state based on the SOI! Essentially, this narrows down the analog years quite well. Of the years I examined – 1958, 1966, 1973, 1988, 1995, and 1998, the closest matches for SOI reversals are 1973, 1988, and 1998, which were all at least weak La Nina’s by midsummer. I don’t believe ENSO will level off at neutral like 1958 and 1966; we should continue the decline into a La Nina the second half of this summer (possibly rapidly). Global atmospheric angular momentum (GLAAM) supports this turn to La Nina conditions as we flip into a negative GLAAM regime. Essentially the rotational speed of the Earth is decreasing, which will heighten the easterly tropical trade winds in the Pacific thereby promoting upwelling and cold water expansion westward. 3) Models – ECMWF, CFS, and statistical/dynamical model forecasts are in solid consensus that we’ll attain weak La Nina status sometime in the June-July time frame. Some individual members are more bullish on the arrival of the La Nina than others, but most portray the same general idea. The ECMWF seems to be the most bullish on intensity. -Weak La Nina status will be attained by June or more likely July in region 3.4. 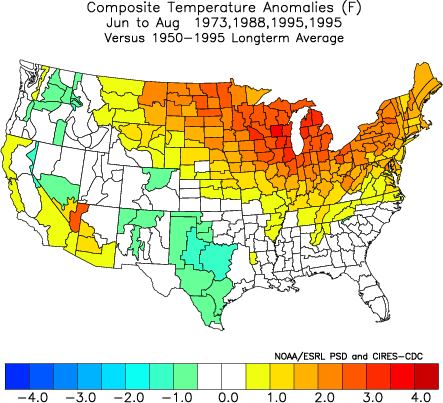 -Strong negative AO/NAO of this past winter will neutralize for the summer. -Positive SOI/Positive GLAAM will persist through the upcoming summer. – High likelihood that at least 2 out of 3 summer months will be at or above normal temp wise. Notes: Northeast region departures should be very similar to those pinpointed for NYC in June, July and August. Precip will be more below normal the further south one heads down the east coast. August will be the warmest month nationwide relative to normal. Overall, a warmer than normal summer is on tap for the Mid-west and MS River eastward – with periods of scorching heat likely. My main regret was not going more extreme with the heat. The above average departures were correct for all three summer months; however, the actual departures were quite a bit higher than I thought in June and July. With that said, this was the hottest summer on record in NYC by 0.5, which means the 2nd hottest summer had a temp departure of +3.0, and the rest of the top 10 between +1.5 and +3.0. So it would have been very difficult to nail this summer as the warmest on record from a long range standpoint. With that said, the warm signals were there and they certainly verified. My analog years of 1988, 1973, 1995 all fared well. In the end, the forecast was good but needed to be a bit more intense with the heat.